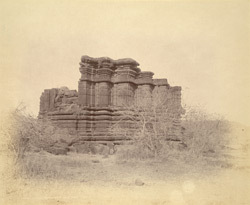 Photograph of an old ruined temple at Durana, taken by Henry Cousens in the 1880s-90s. Durana is a small town situated in Maharashtra. Cousens visited this area and described the temple in the Bombay list, p. 56: ''...on the east of the main road are the ruins of an Hemadpanti temple, standing upon rocky ground in the midst of the fields.'' Cousens visit to Durana was part of a tour of western India he carried out in the 1880s and 1890s. This was undertaken with the intention of recording places and structures of historical interest under the title 'The Archaeological Survey of Western India.' The year he visited Durana, Cousens also made extensive studies of the temples found at towns like Akola, Nagapur, Sinnar and Changdeva to name a few examples.